Nothing brings a smile to a child’s face like cute and cuddly animals. Now imagine a “land” full of furry farm animal friends ... oh, the smiles! 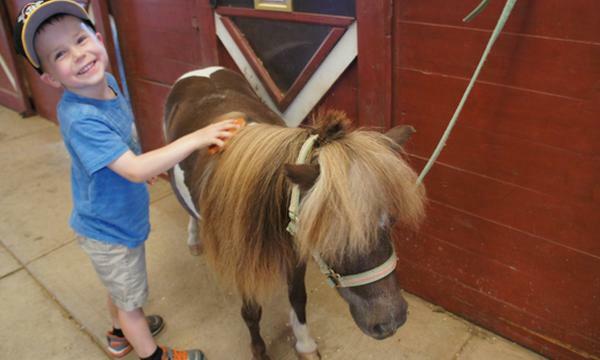 Nestled in picturesque Adams County Pennsylvania, not far from the historic Gettysburg Battlefield, the Land of Little Horses Farm Park is a magical place where the young and young at heart can enjoy a family friendly day in the country. The park is a stage where daily displays of fun and laughter are on the play bill. Inside the climate controlled arena, the stars of the park -- fun loving animal stars that is -- will share their talents to the delight of their guests. Get a feel for farm life by taking part in hands-on activities such as grooming or bathing some of the four legged residents or petting and feeding the barnyard inhabitants. The staff will be on hand to give insight on what it takes to pull together the day to day operations of the park. Displays and special events give guests a chance to get up close and personal with the many animal friends. Make sure to include a visit to the Hobby Horse Café for lunch or a snack and a stop in the Hobby Horse Gift Shop is sure to please the animal lover on your list! Valid for admission for 2 people only. Both admissions must be used on the same visit. Additional tickets can be purchased at full price, paid to vendor. Note: This location is in Pennsylvania. About an hour from DC and Baltimore! Offer valid during regular hours of operation. Click HERE for complete schedule and dates of operation. To Redeem: PLEASE PRESENT A PRINTED VOUCHER FOR ENTRY. Multiple vouchers may be purchased and redeemed. Valid only for the dates listed above. Cannot be combined with any other special offers, promotions or discounts. Not valid on prior purchases. Vendor is responsible for the quality of the products or services provided at redemption. Operating hours are subject to change; check directly with vendor prior to visit. Merchant cancellation policy applies.